"Sanitation is a sector about to transform." Toilet Board Coalition Executive Director, Cheryl Hicks and Toilet Board Member, Satish Rao, CEO, Firmenich India at Global Citizen Mumbai November 2016. Contributed by the Toilet Board Coalition. A commitment is a powerful action. At the Toilet Board Coalition, business commitment to delivering sanitation through the market is compounded exponentially through the power of its unique public-private partnership. 2.4 billion people are still without access to improved sanitation. It's a problem bigger than all of us. It’s bigger than one solution, bigger than one company or one government. That’s why, at the Toilet Board, multinational corporations Unilever, Kimberly-Clark, LIXIL and Firmenich, international development banks and leading organisations have come together to tackle this in a new way. 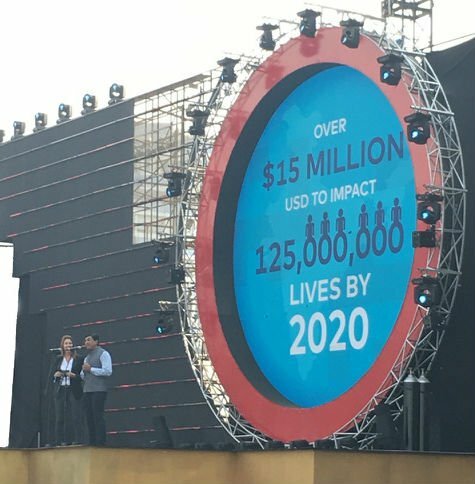 The commitment the Toilet Board Coalition announced in front of 80,000 people at Global Citizen's India Festival in Mumbai this November, 2016 was special. Not only was it a substantive commitment, but it was a commitment by business for the future of business. Toilet Board Coalition believes smart, sustainable sanitation must ultimately be delivered through the market, and they are committed to scaling business solutions to sanitation through the Toilet Accelerator. We think the 2.4 billion people about to have access to sanitation, is the business opportunity of the decade. Which is why our members have committed to work with entrepreneurs in low-income markets to scale their businesses and drive us all, together, towards achievement of SDG6. A public commitment gives us an opportunity to share a vision and to ask you to join us. Sanitation is a sector about to transform. Spread the word — because toilets — are the #NextBigThing. "The Toilet Board Coalition has been created by business for business leadership on SDG6 - universal access to sanitation. We run the Toilet Accelerator, big business offering small businesses bespoke, hands-on mentoring to deliver sanitation through the market. TBC Members have committed over 15 million for sanitation entrepreneurs & mentorship through the Toilet Accelerator, and our corporate members alone have committed to helping over 125 million people gain improved access to sanitation and hygiene by 2020." Learn more about the Toilet Board Coalition here.